The Santora Building is a 1928 Spanish Colonial Revival structure boasting a distinctive facade. From 1934 to 1944, Daninger’s Tea Room occupied much of the second floor, attracting the likes of Jack Benny, Milton Berle, Lucille Ball, Gracie Allen, and George Burns. Today, the Santora is home to art galleries, stores and restaurants. Santa Ana (population 337,977), county seat of Orange County, derives its name from the earliest Spanish exploration of the area, In 1769, Don Gaspár de Portolá, a Spanish expedition party leader, discovered a picturesque valley and river in Southern California which he christened Santa Ana. Under a Spanish land grant, the area was developed as Rancho Santiago de Santa Ana for cattle grazing and farming. In 1869, when William H. Spurgeon purchased 70 acres and plotted a townsite, he maintained tradition and gave the new town the name Santa Ana. In 1886, Santa Ana was incorporated as a city, and today is the financial and governmental center of Orange County and a major city in the state. 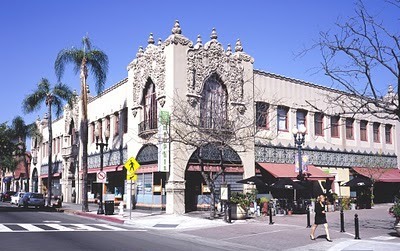 Santa Ana has two historic districts listed on the National Register of Historic Places, including its historic downtown. The City recently partnered with a private developer to rehabilitate the Phillips Block Building (1909/1923), which is located on a prominent corner of the downtown historic district. The building now houses offices and retail stores, and it is proving to be an important catalyst in revitalizing the surrounding area. To help visitors and residents alike to experience the Phillips Block and other downtown buildings, the City partnered with the Santa Ana Historical Preservation Society to produce a walking tour of the downtown historic district. Santa Ana is also developing a citywide historic preservation plan to guide future preservation initiatives.